I have had a lot of people over the last few months email me through the website to identify what the problem is with their Mamod steam engine. They claim that it does not run and struggles to tick over. Therefore, I thought it would be a good idea to compose an article with some of the problems to why a Mamod engine may not work. #1 How Old is the Engine? The washers on the safety valve, water level plug and whistle. Over time, they will have worn down and not produce a gas tight seal to the boiler.A boiler that loses steam loses pressure. A boiler that loses pressure will struggle to push the piston out of the cylinder and tick over. Is there oil around the piston.cylinder assembly and flywheel? If not, the friction might be too much for the engine to tick over. Therefore, dab a bit of oil on all the moving parts of the engine. What is the state of the boiler? You can see how much rubbish is in the boiler by tilting Mamods with a sight glass valve. If it appears there is lots of lime scale and impurities in the boiler, try running the next steam up with a bit of vinegar in the boiler (this will clean the system). As well as this, fill the boiler up and empty it a few times to get the impurities out. #2 Have You Steam it Up Right? Is the water level in the boiler at the correct level? That is enough to gain pressurised steam and not too low enough to damage the engine? Have you placed enough fuel to burn under the boiler? Have you given the engine enough time to gather steam in the boiler? Are all the threaded components finger-tight to the boiler? From owning many Mamod engines, I have found that some engines are generally more powerful than others. For example, my SW1 steam wagon was always quite a powerful engine compared to similar engines. It is just the nature and characteristic of each individual engine. This brings me onto the point that your engine may not run because of the rolling resistance associated with the mobile engines. What I mean is that, for mobile engines, the flywheel is connected to one of the engine's wheels in contact with the ground. This means the engine has to rotate not only the flywheel but the wheel in contact with the ground too. Therefore, the engine will need more power or 'oommphh' to get going. Here is a bit of engineering mathematics. The power of an engine is worked out by the RPM multiplied by the torque (turning force) produced by the engine. At low revs, the engine has not got enough turning force or 'torque' to rotate the rear wheel to enable the whole engine to move. So, to increase the power output of the engine, we need to get the revs up. This can be done by lifting the rear wheel of your engine off the ground, letting the RPM increase and then place the engine back down on the floor. Since the engine's revs are higher, it should continue moving. 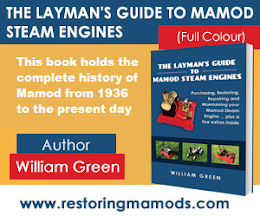 Of course, there are many many more reasons why an engine may not work which I have listed all in a chapter of The Layman's Guide To Mamod Steam Engines as 'Problems Starting Your Engine'.